Emery, C.M, Biancamaria, S., Boone, A.A., Ricci, S.M., Rochoux, M.C., Garambois, P-A., Paris, A., and Calmant, S. (13-Dec-16). 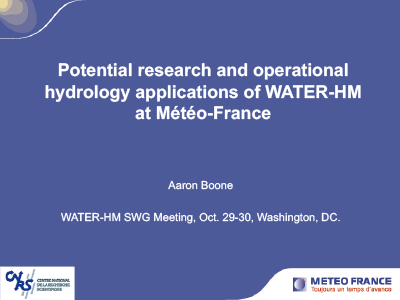 The purpose of this work is to improve water fluxes estimation on the continental surfaces, at interannual and interseasonal scale (from few years to decennial time period). 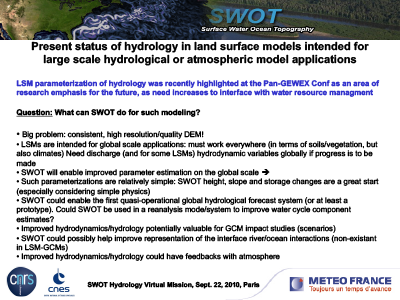 More specifically, it studies contribution of the incoming SWOT satellite mission to improve hydrology model at global scale, and using the land surface model ISBA-TRIP. 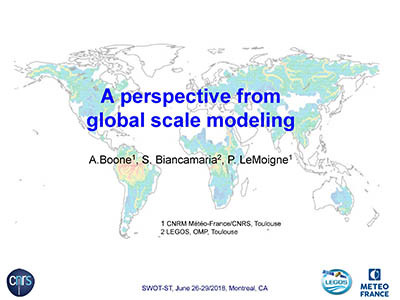 This model corresponds to the continental component of the CNRM (French meteorological research center)'s climatic model. Beighley, E., Zhao, Y., Feng, D., Fisher, C.K., Raoufi, R., Durand, M.T., David, C.H., Lee, H., Boone, A.A., and Cretaux, J-F. (13-Dec-16). 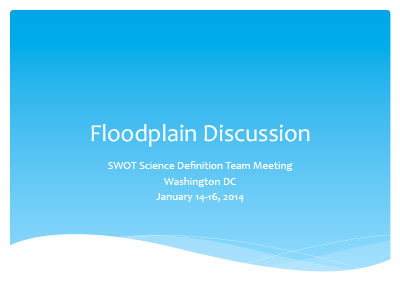 One derived data product planned for the SWOT mission is river discharge. 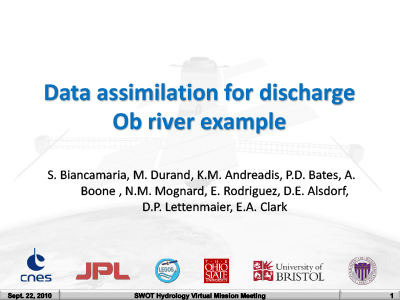 Although there are several discharge algorithms that perform well for a range of conditions, this effort is focused on the MetroMan discharge algorithm. For example, in MetroMan, lateral inflow assumptions have been shown to impact performance. 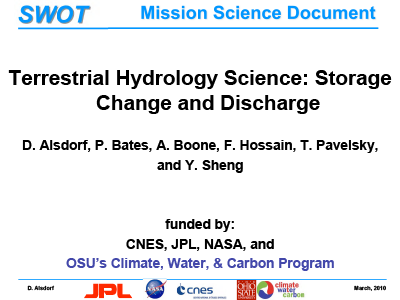 Here, the role of lateral inflows on discharge estimate performance is investigated. 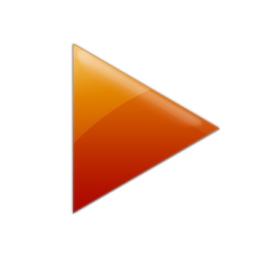 David, C.H., Andreadis, K.M, Famiglietti, J.S., Beighley, R.E., Boone, A.A., Yamazaki, D., Kim, H., Gaborit, E., Rodriguez, E., Biancamaria, S., Paiva, R., and Schumann, G. J-P. (13-Dec-16). 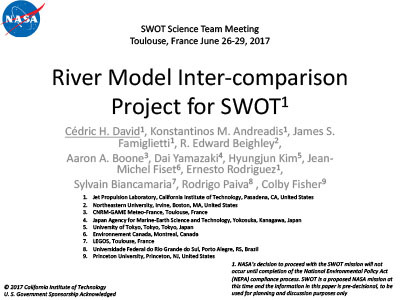 In preparation for the expected SWOT observations, an inter-comparison of continental-scale river models is being designed. We present here the preliminary architecture and early results of the inter-comparison in hope to motivate further community feedback and involvement. Emery, C., Biancamaria, S., Boone, A., Garambois, P-A., Decharme, B., Ricci S., and Rochoux, M. (2016). 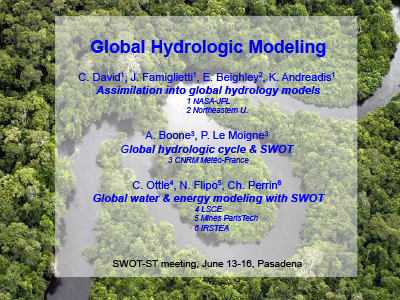 Temporal Variance-based Sensitivity Analysis of the Large Scale Hydrological Model ISBA-TRIP: Application on the Amazon Basin, J. Hydrometeorol., doi:10.1175/JHM-D-16-0050.1. Häfliger, V., Martin, E., Boone, A., Habets, F., David, C.H., Garambois, P-A., Roux, H., Ricci, S., Berthon, L., Thévenin, A., and Biancamaria, S. (2015). 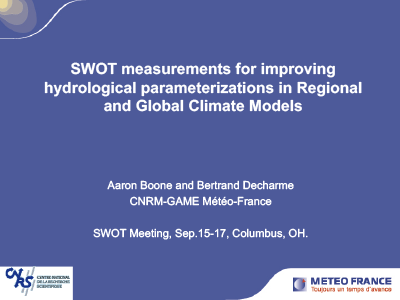 Evaluation of Regional-Scale River Depth Simulations Using Various Routing Schemes within a Hydrometeorological Modeling Framework for the Preparation of the SWOT Mission, J. Hydrometeorol., 16, 1821-1842, doi: 10.1175/JHM-D-14-0107.1. 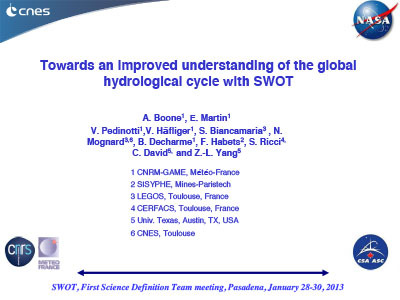 Pedinotti, V., Boone, A., Ricci, S., Biancamaria, S., and Mognard, N. (2014). 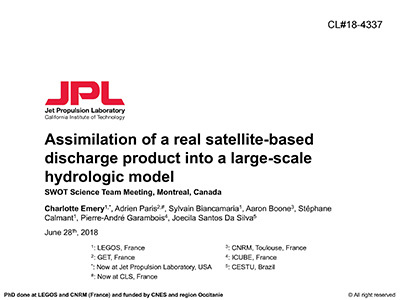 Assimilation of Satellite Data to Optimize Large Scale Hydrological Model Parameters: A Case Study for the SWOT Mission, Hydrol. Earth Syst. 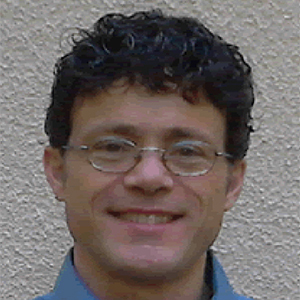 Sci., 18(11), 4485-4507, doi: 10.5194/hess-18-4485-2014. 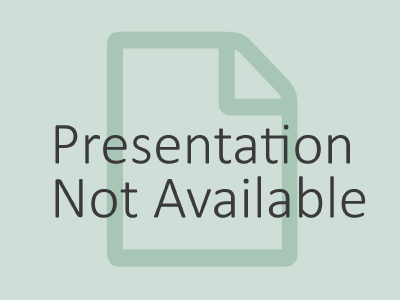 Getirana, A., Boone, A., Yamazaki, D., Decharme, B., Papa F., and Mognard, N. (2012). 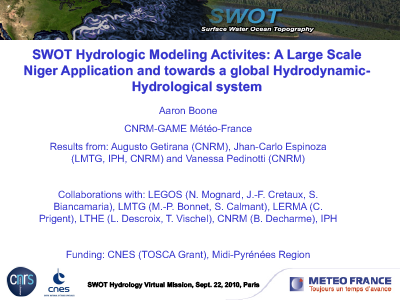 The Hydrological Modeling and Analysis Platform (HyMAP): Evaluation in the Amazon Basin, J. Hydrometeor., 13, 1641-1665, doi: 10.1175/JHM-D-12-021.1. Pedinotti V., Boone, A., Decharme, B., Crétaux, J-F., Mognard, N., Panthou, G., Papa F., and Tanimoun, B.A. (2012). 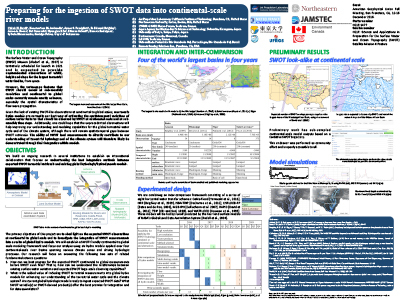 Evaluation of the ISBA-TRIP Continental Hydrologic System Over the Niger Basin Using In Situ and Satellite Derived Datasets, Hydrol. Earth Syst. Sci., 16, 1745-1773, doi: 10.5194/hess-16-1745-2012. Biancamaria S., Durand, M., Andreadis, K.M., Bates, P.D., Boone, A., Mognard, N.M., Rodríguez, E., Alsdorf, D.E., Lettenmaier, D.P., and Clark, E.A. (2010). 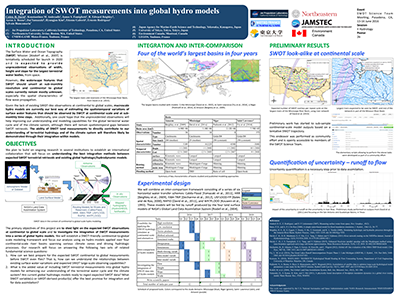 Assimilation of Virtual Wide Swath Altimetry to Improve Arctic River Modeling, Remote Sens. Environ., 115(2), 373-381, doi: 10.1016/j.rse.2010.09.008. Biancamaria, S., Bates, P.D., Boone, A., and Mognard, N.M. (2009). 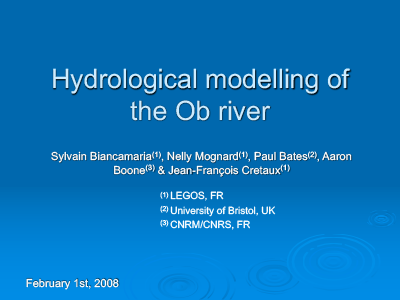 Large-scale Coupled Hydrologic and Hydraulic Modelling of an Arctic River: The Ob River in Siberia, J. Hydrol., 379, 136-150, doi: 10.1016/j.jhydrol.2009.09.054. PI: Aaron Boone (16-Jun-17). 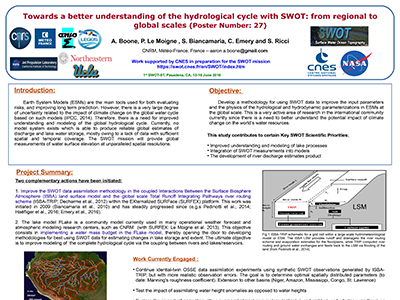 The main objective of this study is to develop methodologies for using SWOT data to improve the input parameters and the physics of the hydrological and hydrodynamic parameterizations in ESMs at the global scale, including rivers, lakes and ground water reservoirs, leading to improved estimates of the corresponding reservoirs and exchanges between them.